Turkey Sausage Stuffed Mushrooms - Ed Hipp Foods, Inc. Remove stems from portobello mushrooms. Arrange the mushroom caps, bottoms up, on a medium baking sheet. Chop the stems and set aside. Place turkey sausage link on a small baking sheet. Cook uncovered in the preheated oven 15 minutes, or until the interior is no longer pink. Remove from heat and chop. In a medium saucepan over medium heat, mix together chopped mushroom stems, chopped sausage, chopped garlic, crushed garlic, cayenne pepper, black pepper and seasoned bread crumbs. Slowly cook and stir 5 to 7 minutes, or until bread crumbs begin to brown. Remove from heat, allow to cool approximately 10 minutes and transfer to a medium bowl. Mix cream cheese and Parmesan cheese into the mushroom stem mixture. Stuff the mushroom caps with the mixture. 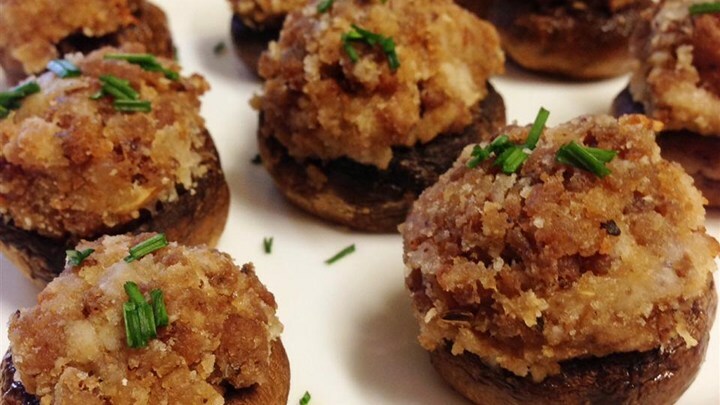 Bake stuffed mushrooms in the preheated oven 20 minutes, or until stuffing is lightly browned. Source of recipe and photo: Allrecipes.com. Recipe by CAROLINENOW. Original title “Caroline and Brian’s Stuffed Mushrooms.” Note that original recipe did not specify Ed Hipp’s brand sausage.